Regrow your hair with the powerful combination of the latest laser beam technology, an FDA approved regrowth pharmaceutical, and a proven scalp and follicle treatment program. Visible benefits can occur in four months. Our laser therapy gives you the power to regrow your own hair. Using a potent combination of FDA approved regrowth medication, our trusted scalp and follicle treatment program and, of course, our sophisticated laser beam technology. Our laser hair growth treatment has achieved a 95% success rate, based on monitoring by hair loss medical professionals. Associate Professor of Dermatology at Harvard Medical School, Dr Michael R Hamblin, had this to say about our laser hair growth therapy. “I would assert that the Advanced Hair Studio parameters are well within the range of parameters that have been shown to be successful for hair regrowth and that there is, therefore, no reason to doubt that the treatment would regrow hair in suitable subjects (i.e. thinning hair),” said Hamblin. You can read Dr Hamblin’s full report here. How Does Laser Hair Growth Treatment Work? Our patients have reported visible benefits within just four months of using this type of treatment. 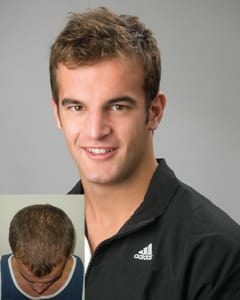 According to a university clinical trial conducted by Advanced Hair Studio, eight out of ten* men who underwent Advanced Laser Therapy® experienced Laser Hair Regrowth within four months, using a combination of Advanced Laser Therapy, an FDA-approved hair regrowth pharmaceutical and a proven scalp and follicle hair loss treatment program. We use cold laser therapy, which utilises a low-level laser. Our laser has been approved by the Therapeutic Goods Administration and the FDA. What testing has the program been under? Our cold laser therapy for laser hair regrowth has been extensively tested, both in our clinical studies and through external sources, including experts in photodynamic therapy, like Dr Hamblin. No, laser therapy for hair loss has been in use for a significant amount of time, and no side effects have been reported. We use a low-level laser which means there is no pain involved. It is an entirely non-invasive procedure. Hair loss begins to occur when the follicles that grow hair become dormant. This happens as we age, or as a result of other factors like genetics, medications, lifestyle and stress. The laser stimulates the hair follicles, which absorb the light and resume growing hair. Laser therapy works best in the early stages of hair loss, and in conjunction with other treatments. If you feel as though your hair is thinning, we recommend you visit us as soon as possible for a free Hair Check. The sooner you begin treatment, the more effective it will be. Men suffering from hair loss can benefit enormously from our laser treatment. Laser treatment delivers results that can influence your entire life. We’ve seen so many patients walk into our clinic lacking in confidence, only to leave with a new lease on life.